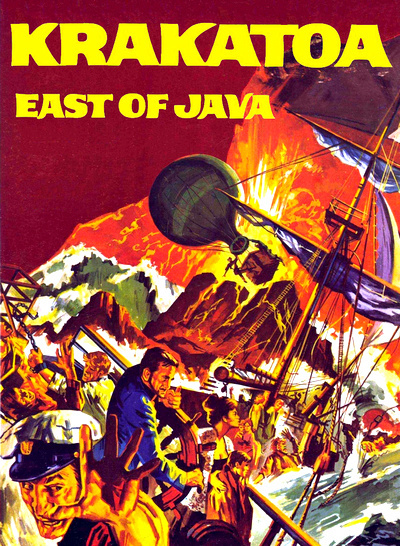 For some critics and audiences, the trivial geographical error in the title of Krakatoa: East of Java (1968) was enough to invalidate the entire movie (Krakatoa is actually west of Java), a complaint that seems especially silly considering how many Americans can't find the United States on a world map. Krakatoa: East of Java is often considered one of the earliest disaster movies. The story loosely revolves around the cataclysmic 1883 eruption of the volcanic Krakatoa island, a disaster that unleashed hot ash and 100-foot tsunami that killed more than 36,000 people, and whose explosions could be heard and felt 3,000 miles away. A group of treasure hunters led by Captain Chris Hanson search the waters of Indonesia to find a sunken ship that could possibly hold some of the best pearls ever found. Trouble ensues when the crew have to transport 30 criminals to a nearby prison island. In doing so, they come across the pearl ship near the erupting Krakatoa. It’s a race against time to get out of there with their lives intact and maybe a little more.